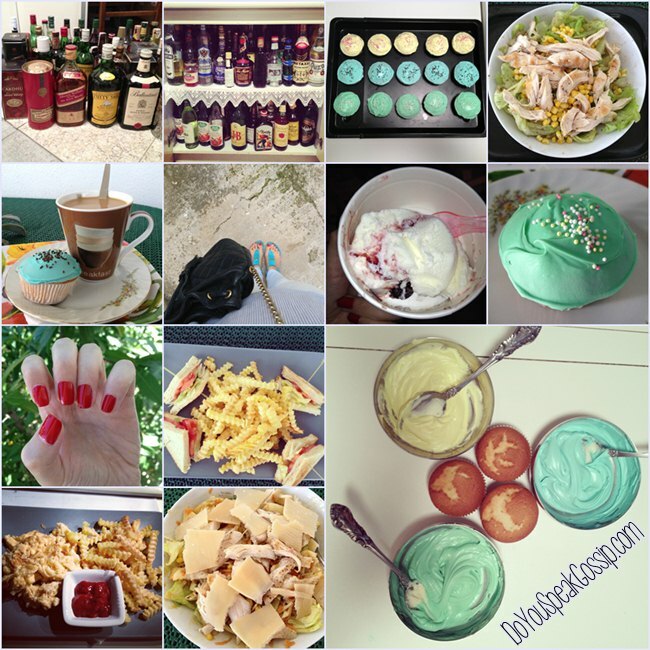 My month in pics - Do You Speak Gossip?Do You Speak Gossip? From left to right: All-black outfit, Classic with a twist, On Stripe, A pop of sherbet, Hello Kitten and my favorite, Pastels with a hint of neon. You can click on the links to visit the original posts to see more outfit details, and maybe leave me a comment on them. April also had some of my favorite manicures for a long time. Some of which, you could see in my outfit posts, and some only on my Facebook page. I gathered them all together, for all of you to see. From left and clockwise: Snakeskin manicure, Pastel colored manicure, newspaper print manicure, and midnight blue matte manicure. I decided not to photograph all the Easter food, ‘cause it would be boring to see food again. Plus I hadn’t my camera with me on Easter…But, I have some Easter decorations of my house to show you. 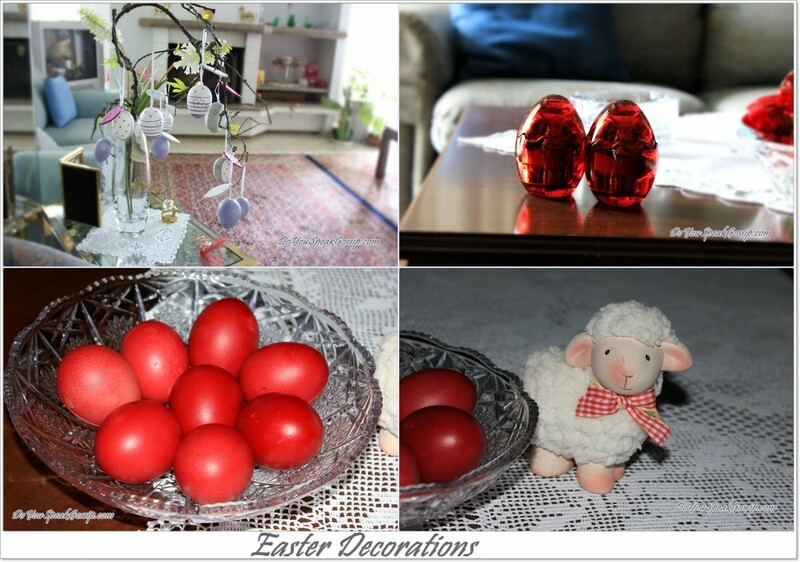 Easter eggs hanging on a “tree”, Easter eggs/candles, red Easter eggs (red per tradition), and a cute sheep decorative. A few days after Easter Sunday, we celebrated my grandma’s birthday! She’s officially 92 years old, and we are so proud of her, that she managed to make a full recovery from her surgery, in such a short period. She’s been walking and doing almost everything by herself for a long time now. We bought her a beautiful bouquet for her birthday with my cousin. We also made a bouquet from all the beautiful flowers in our garden which are in full bloom. 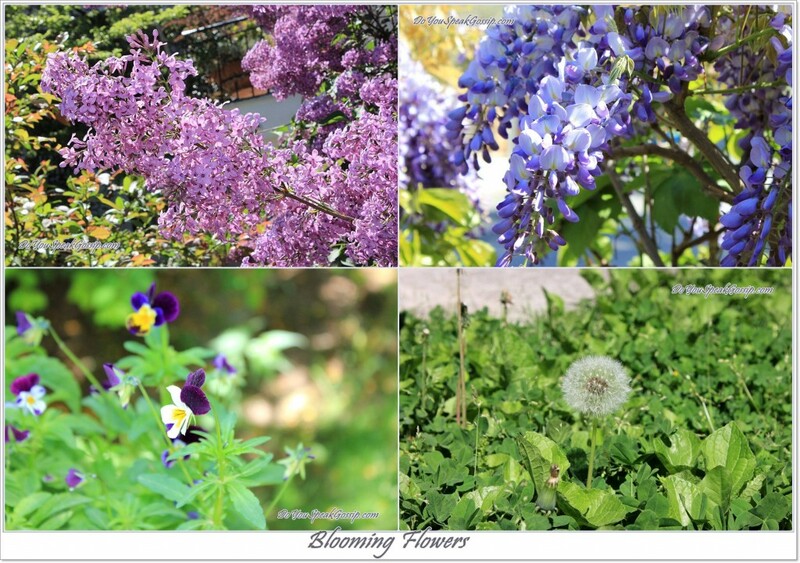 I love spring, so much! 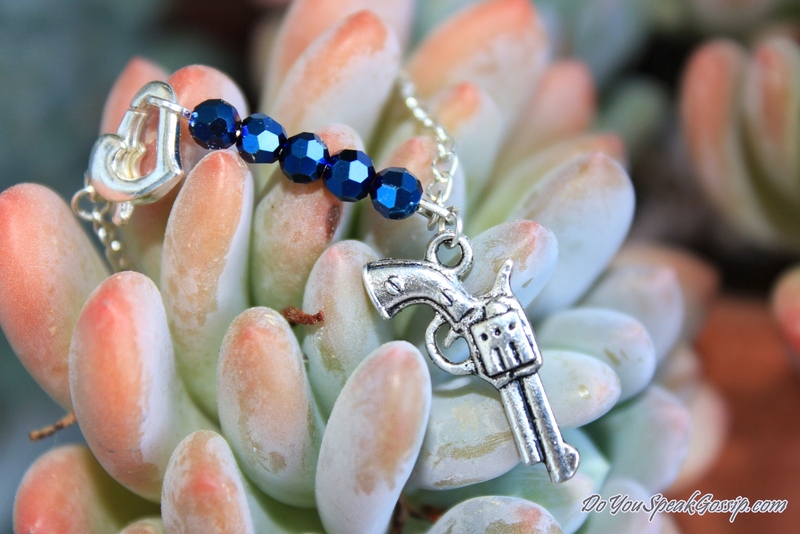 Last but not least, I’m so happy that I was the winner of a very nice giveaway, and I won a fantastic bracelet, made by the very talented Ramona from the blog Strike a pose. I chose this bracelet with the gun, but it was a difficult choice because she has many more beautiful designs. I really loved the clasp which is shaped as a heart. You’re definitely gonna see me wearing it really soon. Το μπλε μανικιούρ ειναι απλά φανταστικο!!! 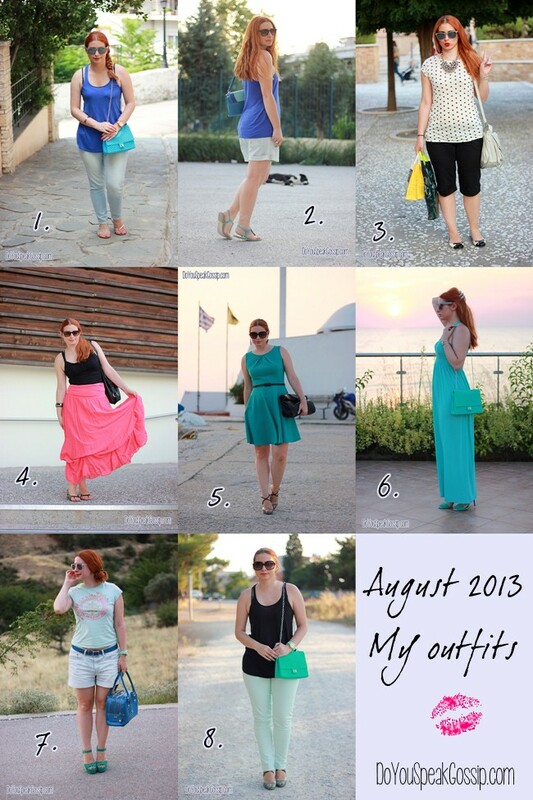 Ασε τα outfits..δεν μπορω να σου πω ποιο ειναι το αγαπημένο μου..νομιζω οτι τα λατρεύω όλα!! Kerasia recently posted..Haul: Sephora, Too Faced, Opi, China Glaze & Nubar με 30 ευρώ!! vanda recently posted..Boyfriend loves Pink!! So many lovely outfits.. I love the last one! Pwpw! Wraios minas, oson afora toulaxiston ta outfits mias kai oloi exoume liga kilakia parapanw meta to fagopoti tou Pasxa! Xaxa! Nomizw apo ta pio agapimena mou einai ta 2 teleytaia (twra pou mpike i Anoiksi gia ta kala ti kalytero apo ta xrwmata kai eidika an einai toso wraia syndyasmena)! Ta manicures fovera opws episis kai to spiti sou! To exete diakosmisei me poly gousto! these are all so cute! and so appropriate for april! Kate V recently posted..New in: Guess what?! S’euxaristw para poli! 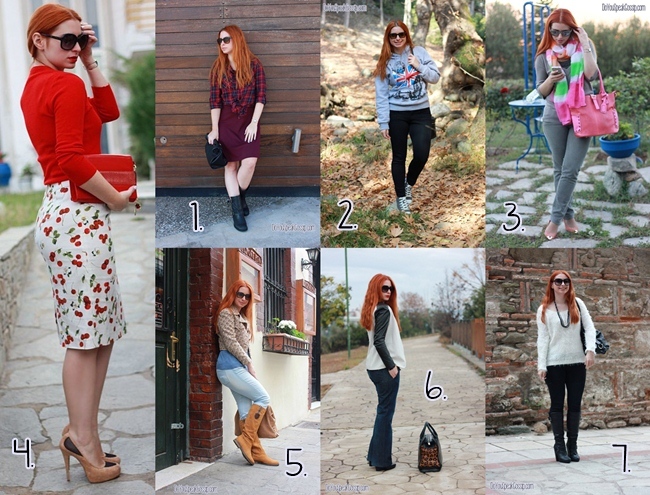 Tha deis poli sintoma kai alla outfits me pastels…exw idi vgalei fwto…apla panta sto telos kai stin arxi tou mina kanw to “month in pics” kai to “wishlist” kai pane ligo ola pisw, alla den peirazei! 🙂 Elpizw na s’aresoun otan ta postarw! Such wonderful pictures love! April was really your month. You looked amazing the whole time! Wonderful blog love. Truly inspiring. I would really be so incredible, if you could check out my latest post! Kalispera, kai kalo mina kai se sena! Elpizw na peraseis katapliktika simera, oti kai an kaneis! I’m finally back!!!! I missed you very much, and your posts! I just saw them now, first by clicking on your page and second, now through your Month in Pictures! The outfits, I mean! Anyway, congratulations to your grandma! Wow, 92, it’s amazing! Last night I dreamed of Greece! That I should go there, haha! For sure, I am sure I’ll go back one day! Now, your outfits! I can’t decide which is my favorite! I love all of them! Maybe the black dress/boots… I love it! But the one with the pinted blouse, I also love! In fact, all of them could be an editorial, for the pages of any top fashion magazine in the world! So elegant and stylish! Filakia polla, glad I could comment on your post again! Welcome back Denise! I’m so glad to have you back again! I’ve missed you too, very much! You’ve been gone for about a week. I’m sorry to hear that you’re so tired. I’m tired too, today, I did a few things at home, with my shoes, cause I want to take part to Shoeper Shoe challenge as well, but I’m sure I’m not nearly as tired as you! I’m just not used to doing so many stuff, or carrying so much weight around. I’m glad you had the chance to see my outfits, cause I really liked most of these from April. My favorite is definitely the last one with the pastel colors. 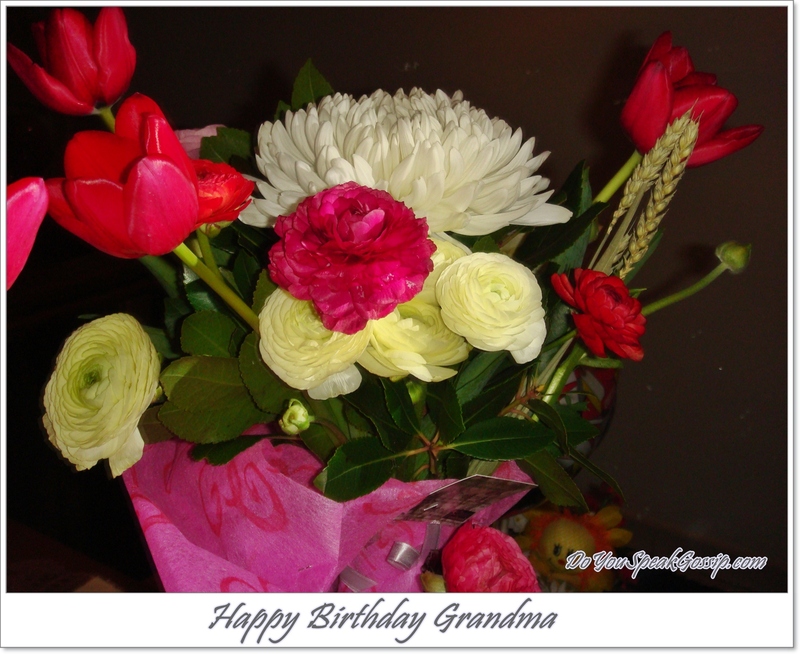 Thank you so much for your sweet words, and for your wishes about my grandma! I really hope you can visit Greece again sometime in the “near” future, so I can be your guide, and get to know you in person. May’s wishlist is coming up tomorrow..Although I have to admit, that I haven’t written the “article” yet, but I will really soon! hehe…I also have a few more outfit posts in the line to be posted soon, so I might have to post more frequently than usual. We’ll see…. I know it’s so difficult, when you don’t have your own space, and your peace and quiet at the same time…I wish we could have it all! Thank you so much for stopping by my blog. You left such a sweet comment. Hope you will return soon? san to teleio pastel outfit dn exei!eidika twra pou eida merika apo ta kommatia apo konta <3 perimenw na dw ta nea papoutsia!!! hehe nai exw pathei psixwsi me ta pastel teleutaiws! Tha ta deis poli sintoma, alla exoune “proteraiotita” kapoia alla post…aurio i nea wishlist kai isws paraskevi ena outfit post….tha deis kai auto pou forousa xthes kapoia stigmi, sintoma! Michelle Ho recently posted..AIN’T POP BUT FLOP. The outfit with the yellow pants is my favorite. Fun! this month flew by, but I’m glad it’s over! I’m ready to start anew! I’ve been meaning to try that newsprint nail. Looks pretty! Thank you! I really enjoyed the newspaper print manicure! At first I didn’t succeed and I was gonna give up, but then I decided to try again. And it was really easy! Just use a new newspaper so that the ink is not so dry. se eyxaristw poly gia to comment kai to support! einai eytyxia ne moy leei mia stylish kopela oti parakoloythei to bog moy taktika! be in touch! Se “parakolouthousa” apo tin proigoumeni fora pou eixes afisei comment sto blog mou kai pragmatika thewrw oti exeis poli wraio kai idiaitero stil! Καλό μήνα βρε κορίτσι!! Πώς πέρασες την πρωτομαγιά σου; Πολύ ωραίος δείχνει ο μήνας σου, γεμάτος! Μου άρεσαν πάρα πολύ τα νύχια σου και τα outfits σου! Χρώματα ανοιξιάτικα και δροσερά! Φιλάκια! beautiful idea and lovely outfits! What a fantastically fashionable month for you!!! 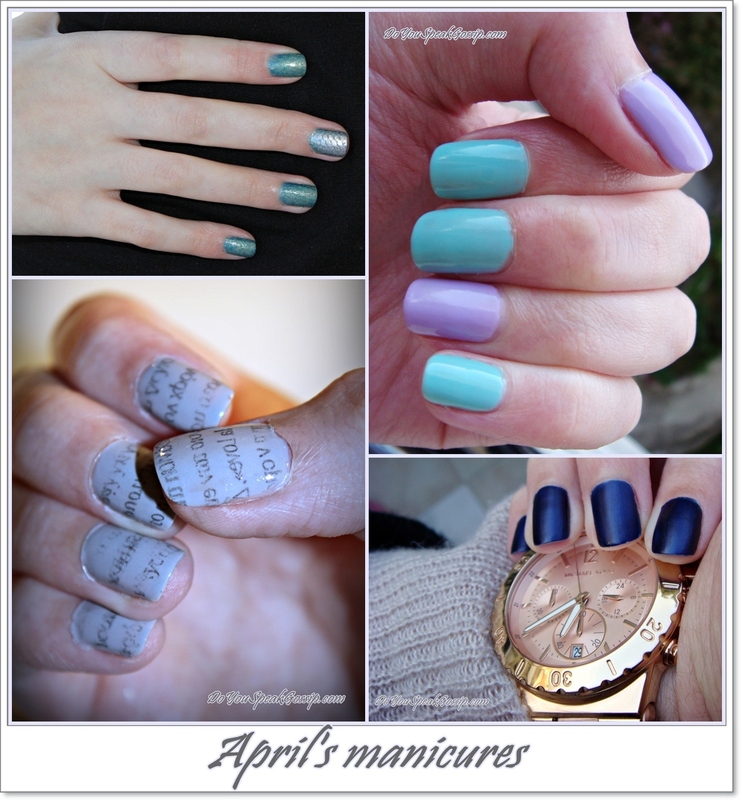 Really lovely outfits and the nail art is such an inspiration… Beautiful photos. Thank you so much Sada! 🙂 Really glad you liked them. Looks like you had a brilliant month! Love all the outfits lined up like that, really shows off your style! Pingback: Mom’s birthday party | Do You Speak Gossip?